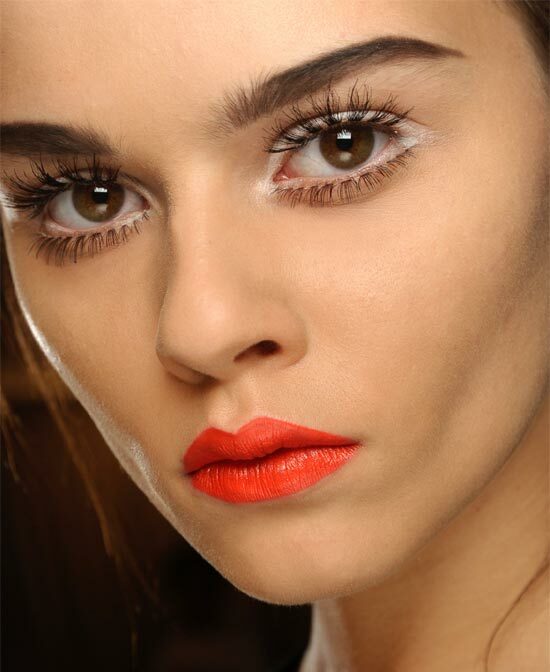 Using M·A·C Cosmetics, makeup guru Tom Pecheux created a “60’s meets Lana Del Ray” with lots of lashes and a bright orange lip at the Moschino Spring/Summer 2013 show. * Fix + — spritzed over skin to hydrate and refresh. * Prep + Prime Moisture Infusion — massaged into skin to soothe, revive, and instantly replenish. * Select Moisturecover — used as needed to perfect. 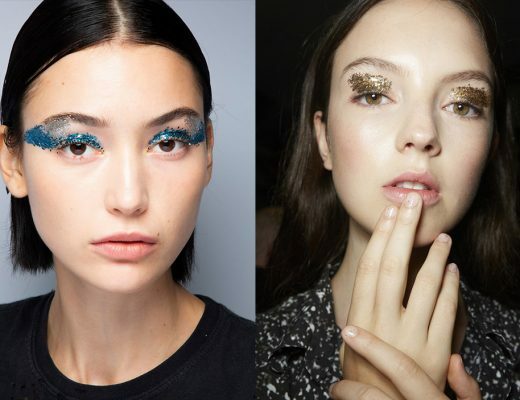 * Fascinating Eye Kohl — applied through the waterline and layered with Gesso Eye Shadow with 219 Pencil Brush to set. * 35 LASH — trimmed and applied above upper lashline. * 33 LASH — trimmed and applied through the lower lashline. * Haute & Naughty Mascara — blended through both upper and lower lashes to perfect and define. * Brunette or Deep Dark Brunette Luxe Brow Powder Pencil and Deep Dark Brunette or Redhead Brow Fluidline (available Spring/Summer 2013) — drawn straight through the brows to accentuate. * Morange Lipstick — blended over the entire lip. * Clear Lipglass — finishes the lip with a glossy coat. Images: Courtesy of M·A·C Cosmetics.